Sail & Rail fares allow you to travel from any UK station to Douglas (Isle of Man), or from Douglas to the UK. The tickets, which are available on Loco2, include a train journey within the UK and a ferry crossing. Please note you'll need to book a reservation for the ferry separately. 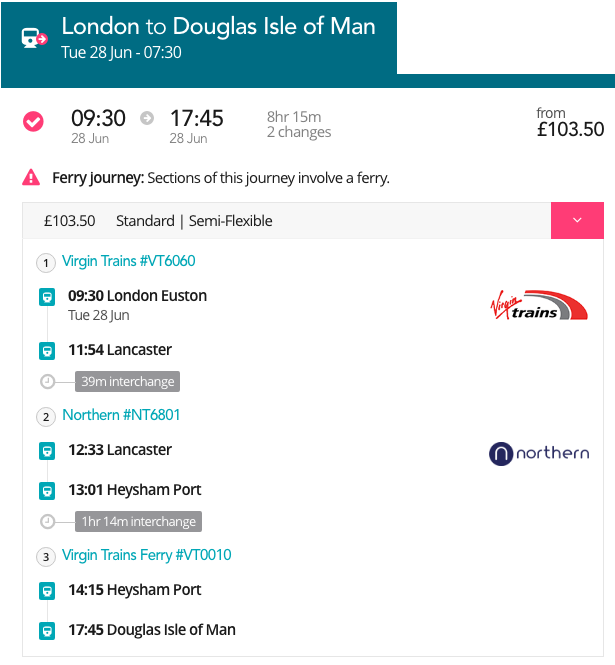 Tickets (one-way or return) from the UK to the Isle of Man, via Heysham or Liverpool, can be booked on Loco2 by entering "Douglas Isle of Man" as your destination. The journey shown will indicate suitable train times and a recommended ferry crossing. You will see a warning, "Sections of this journey involve a ferry." Warning: Please note that this ticket does not guarantee passage on the recommended ferry, which requires a separate reservation. See advice below for adding a reservation. It is not currently possible to book tickets (one-way or return) from Isle of Man to the UK since there are no National Rail ticket collection facilities on the Isle. To book your Sail and Rail trip from the Isle of Man via Heysham or Liverpool, please visit the Steam Packet ferries booking office at the Ferry Travel Shop in the Sea Terminal, Douglas. (Open daily between 09:00 - 18:00.) More information is available from the Steam Packet website. Depending on availability, it may be possible to obtain a reservation for the ferry on the day of travel. However, we do not recommend this, particularly during spring/summer, the TT and for the Festival of Motorcycling in late August when ferries can be busy or even sold out. We strongly recommend that you check for space on the ferry with the Steam Packet reservations team and secure a separate reservation for the ferry before you proceed through checkout. Once you've decided on your travel dates, place your Sail and Rail fare in your basket, check that there is space on the ferry, complete checkout and reserve your ferry space. You can make a reservation for the ferry free of charge by contacting the Steam Packet reservations team at IOM.Reservations@steam-packet.com or 01624 661661, who will issue you with your ferry reservation, subject to availability. Sail and Rail tickets can usually be held in your basket on Loco2 for a couple of hours. We recommend calling Steam Packet to ensure you can secure a reservation for your preferred sailing before you confirm your train tickets.